Most Propane storage tanks in standby-plant service are steel, non-refrigerated pressure vessels. Aboveground and underground storage options are available in a variety of sizes. New vessels are constructed in conformance with all current requirements of ASME Section VIII, Division 1 and designed for at least 250 psig working pressure. Common tank sizes and approximate dimensions are shown in the chart below. Larger industrial and commercial applications generally use 18,000 gallon and larger tanks. Required tank trim includes relief valves, excess flow valves and gauges for temperature, pressure and liquid level. Remote / automatic valve features are often required or desired to provide enhanced product control and safety. At some locations, "special protection" for tanks (such as mounding, burial, insulating coatings or water-spray systems) may be required or desired to reduce the already small potential for fire-induced tank failures. 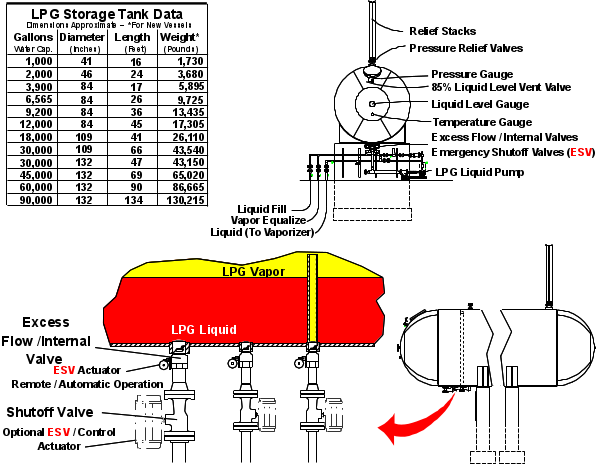 To allow for expansion of the liquid propane, tanks are never filled to 100%. At 60° F, the maximum filling density is about 85%. 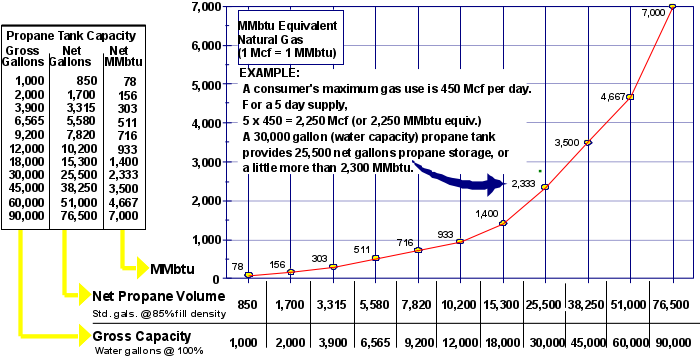 The chart and graph below show common tank sizes and net fuel storage capacities in gallons and "millions of Btus" (MMBtu) (1 MMbtu = 1 Dekatherm.) . Remote / automatic safety valves are standard storage tank trim on SSi systems. Note: To purchase the Enhanced Package you must also purchase the Enhanced Control Option, which includes a Programmable Logic Controller (PLC) necessary to read the transmitters.